Right plumber are here to help you and advise on the vast range of water treatment systems. We can resolve hard water problems including limescale and sediment build up, to bitter tastes or chlorine odours. The are serval different methods of water treatment system available. Below are the most common methods available to improve the quality of drinking water. These systems may be used alone or in combination. Improves the taste, odor and clarity of drinking water. Carbon is most commonly used to adsorb chlorine and chloramines from city water. Carbon is a recognized treatment technique for removal of certain organic contaminants such as trihalomethanes, trichlorethylene, paradichlorobenzene and others. However, carbon will not remove total dissolved mineral salts from water alone. Uses household pressure to separate water from dissolved mineral salts. The product water enters a holding tank for use through a special faucet on the sink. 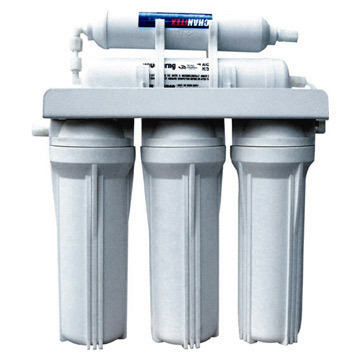 RO systems utilize a sediment filter, a semi-permeable membrane, and a carbon filter to produce a low-mineral, low-sodium, good tasting drinking water. RO is used by many bottled water companies to produce their high-quality product. Utilizes heat to evaporate water. Impurities are left behind and flushed to drain. The steam is condensed back into liquid form and is cooled to become distilled water. Used for drinking and cooking only, bottled water can be delivered to homes or businesses in five-gallon containers, can be purchased from vending machines found outside many markets, or purchased in prepackaged containers in most grocery stores. Some bottled water is tap water or well water that is treated by reverse osmosis and/or carbon filtration. The law requires “spring” water to be water from a natural spring. Although it may or may not be treated, depending on its quality, all bottled water is disinfected, usually by ozonation or ultraviolet sterilization. Water can become “hard” as water passes through the atmosphere in the form of rain, snow, sleet, hail, dew, or fog, it picks up minerals along with gaseous and bacterial impurities. And, because water is the universal solvent, it picks up even more impurities in ponds, lakes, and rivers, as it percolates into the underground water table. Water hardness is measured in grains per gallon (gpg). Water can be softened with detergents, chemicals or other compounds that can be very expensive. The most commonly used method is ion exchange softening which is relatively inexpensive and provides the luxury of using more natural types of cleaning products for household chores and personal care. It is to YOUR benefit, as a consumer, that all your water-using appliances are operating as efficiently as possible. We are here to discuss free no noobligation ways to increase your water efficiency. We know that some areas of the Costa Blanca have notoriously hard water, amplified in some areas set a little further back from the coast. Jalon, Orba, Alcalali, Altea, Senija, Calpe, Moraira, Javea, Denia, Pego, Oliva and many more towns situated on the Costa Blanca have all benefited from a Right Plumber water treating solution.